We began our journey on May 24th 2003, with entry into the Early Bird Sprint Triathlon as a team – ‘The Killer B’s’. Kat was the swimmer, Kev the cyclist and runner. We were excited to try something new for fun and fitness, but had no idea at the time that this simple step would set us in motion and initiate a series of worldwide adventures. If you'd like to read more about our accomplishment, and how we got here, check out our 'about us' page for the deets! Since 2006, we have raced in 18 Ironman events around the globe, including the Ironman World Championships in Hawaii, North American Championships in Mont Tremblant, European Championships in Frankfurt Germany, Lanzarote Spain, Florianopolis Brazil, Nice France, Cozumel Mexico, Penticton, Lake Placid, Panama City Beach Florida, and Ottawa Canada. We've also raced in five Ultraman events - Ultraman is a 3 day, individual ultra-endurance triathlon event consisting of a 10K swim, 420.6K bike, and 84.3K run. Our first taste at this distance was at Ultraman Canada in 2011, and loved the event so much, we returned to race Canada in 2012 to race it again. We also took on the Ultraman World Championships in Hawaii that same year, which earned us recognition as the 2012 Canadian Ultra Distance Male and Female Triathletes of the Year. In 2014 & 2015 we returned to the Big Island to race in our 4th & 5th Ultraman events, which earned us the recognition of being the Guinness World Record Title Holders as the 'Most Ultraman triathlons completed by a married couple'! We have also completed two successful 'R2R2R' double crossings of the Grand Canyon. and savoured every moment of those epic journies! As you will see from our photo gallery, we train and race to the best of our abilities, while keeping our objective of 'fun and fitness' always in the mix. As we look ahead, we also take time to look back. To savor the road we have traveled, to always remember how fortunate we are to have the spirit and health to adventure out and see new things, meet new people and to "LIVE OUR WHOLE LIVES" each and every day. We hope you enjoy visiting our site and find something interesting or inspiring from our journey through life and share some of our enthusiasm for the sport we have grown to love so much. Happy training and racing... hopefully we'll see you somewhere out there on the 'big blue marble' that is our playground! We are thrilled be leading run/hike events again this year at the 2018 Wanderlust Festival in Tremblant this August! Wanderlust is a unique mountaintop adventure of yoga, music and events celebrating mindful living with a community of yogis and artists from all over the world! Come join us for some fun on the hills! "To speak of an Ironman race as “fun and relaxing,” you need to be either nuts or some species of superhuman. Our Montreal-based ambassadors Kevin and Katherine Calder-Becker are doubling-down in the beyond-ordinary stakes. On November 28, they dive into the surf off the coast of Kona to race the 36-hour Ultraman World Championships. And here’s the kicker: they actually seem perfectly sane."... 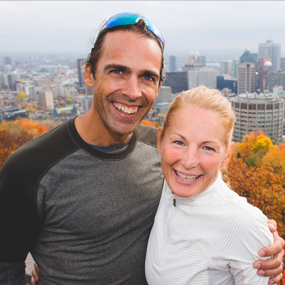 click here to keep reading our story on the lululemon blog... We were thrilled to be interviewed for the Journal de Montreal by Veronique Champagne as we finished up our training for the Ultraman World Championships in Hawaii this past fall. You can read the in-depth interview here! 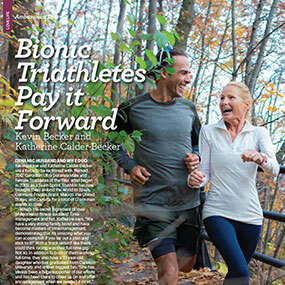 Check out this feature from the December/January 2015 issue of Sweat Equity Magazine! 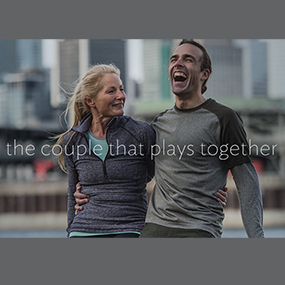 It's a fun feature they do on in each issue on one of the lululemon Ambassadors. In this issue, they chose to feature us, and write about our story!